The latest news can be found on UDC’s News & Media webpage. 8/13/15 – Ground Breaking Smartphone Career Services App!!! 3/16/15 – Congratulations to the Beta Sigma Upsilon Chapter of the Phi Theta Kappa Honor Society at the Community College on their recent honors. 1/20/15 – UDC Law Ranked Number 2 in Diversity! 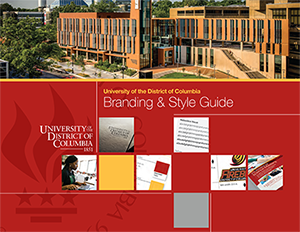 Click here or image below to view branding guide.